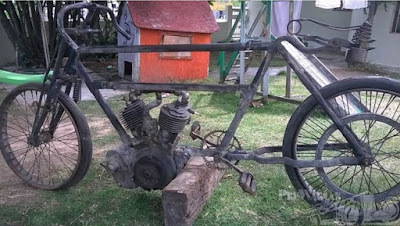 -JdK- For sale on Prewarcar.com; a 1907 Norton. It looks in very good shape for a bike over one hundred years old though any buyer should do his homework and have a very close look at all the details and period pictures before making the purchase; little is known about these machines. Front forks, wheels and handlebars appear to be incorrect. The frame is too long, and the rear section is incorrect, while the frame lugs are too heavy. The saddle on the 1907 Norton fits in the top frame tube. 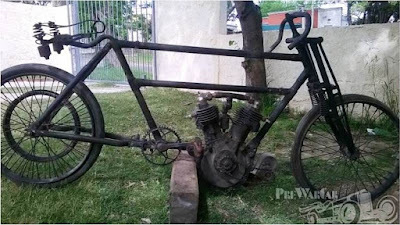 The Peugeot engine may be correct for the period but it was used by other manufacturers besides Nortons. All in all, like a certain other supposedly 1907 Norton, it appears to be a random collection of parts!